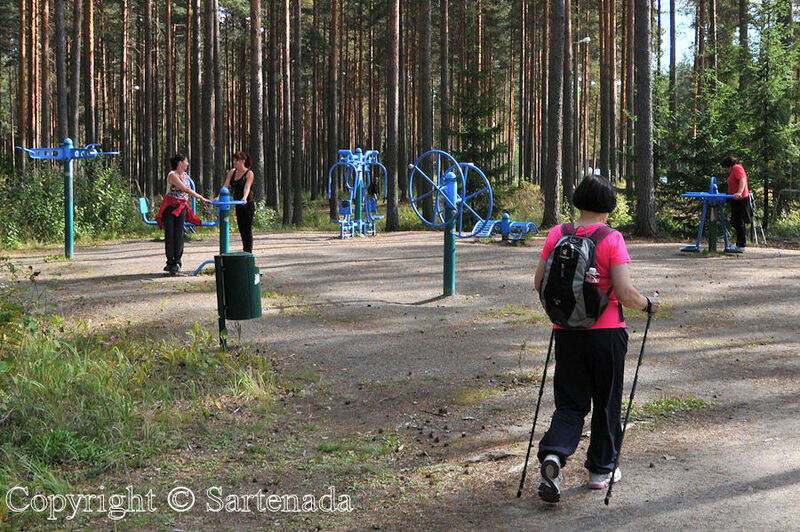 Nordic walking is yet popular in Finland although it was invented in 1997 by Marko Kantaneva. Its “basics” were made known in 1974 by Mauri Repo. 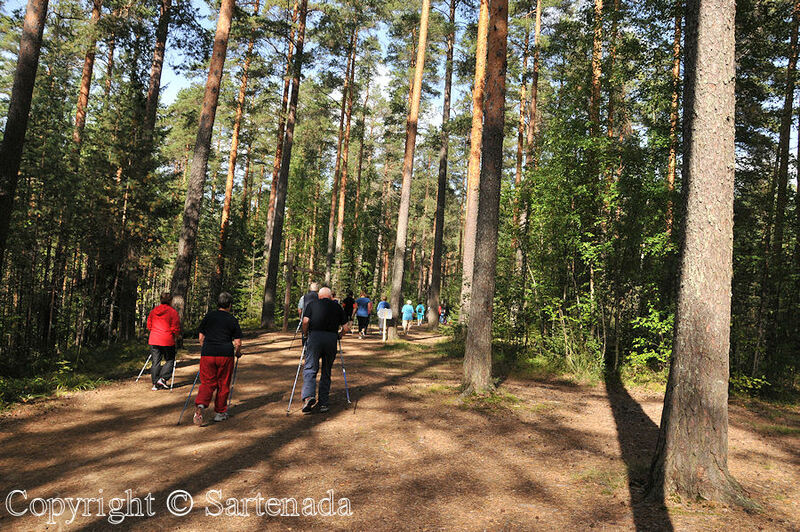 In this post I show how people in my home town practice Nordic walking on a beautiful summer day. My photos go this way: Warm-up, walking, before the start, rest stop and arriving to the departure place. Two last photos are some weeks later when we walked the route again. 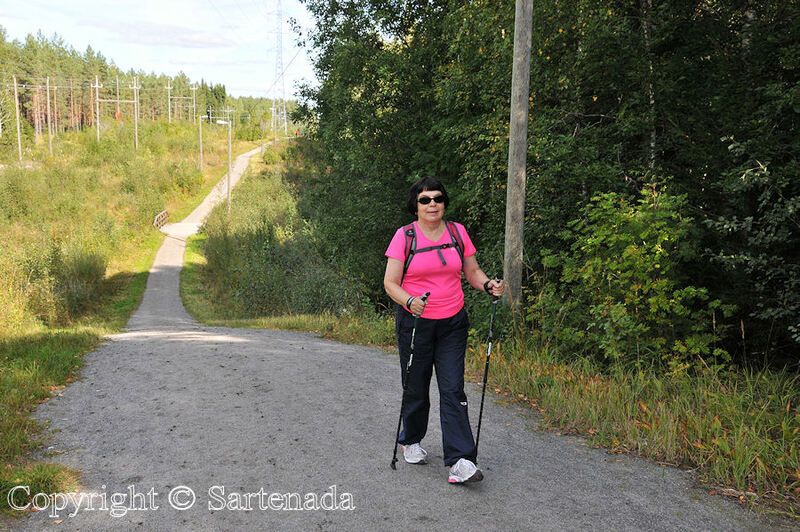 If You are interested about Nordic walking, after photos I give some links to better know what others write about it. 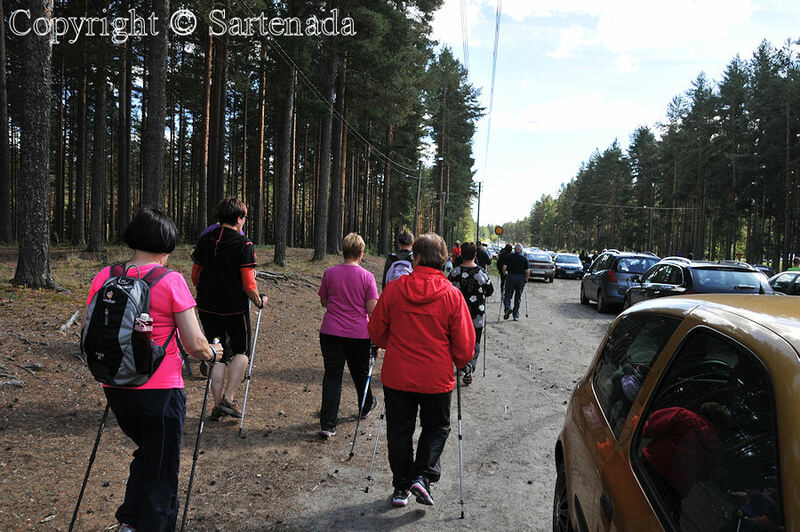 Nordic Walking es aún popular en Finlandia aunque fue inventado ya en 1997 por Marko Kantaneva. Sus “básico” se dieron a conocer en 1974 por Mauri Repo. En este post voy a mostrar cómo la gente en mi ciudad natal practica caminata nórdica en un día soleado de verano. Mis fotos van de esta manera: calentamiento, antes de comenzar, caminando, área de descanso y llegando al lugar de salida. Dos últimas fotos son algunas semanas más tarde, cuando caminamos la ruta de nuevo. Si usted está interesado acerca de la marcha nórdica, despues las fotos voy a dar para Vosotros algunos enlaces para conocer mejor lo que otros escriben sobre él. Para practicar la marcha nórdica, Usted necesita sólo bastones de caminata nórdica. La marche nordique est encore populaire en Finlande bien que elle a été inventé déjà en 1997 par Marko Kantaneva. Ses “fondamentaux” ont été portées à la connaissance en 1974 par Mauri Repo. Dans ce post, je montrerai comment les gens dans ma ville natale vont pratiquer la marche nordique sur un jour ensoleillé d’été. Mes photos vont de cette façon: Warm-up, lavant le démarrage,a marche, aire de repos et arrivant à l’endroit de départ. Deux dernières photos sont quelques semaines plus tard quand nous sommes entrés de nouveau la route. Si vous êtes intéressé au sujet de la marche nordique, après mes photos je donne quelques liens pour mieux connaître ce que les autres écrivent à ce sujet. Pour pratiquer la marche nordique, vous n’avez besoin que de bâtons de marche nordique. A caminhada nórdica é popular ainda hoje na Finlândia, embora ele foi inventado em 1997 por Marko Kantaneva. Seus “princípios” foram dados a conhecer em 1974 por Mauri Repo. Neste post vou mostrar como as pessoas em minha cidade natal praticam a caminhada nórdica em um belo dia de verão. Minhas fotos vão desta maneira: fazendo aquecimento, antes do início, a caminhada, parada de descanso e chegando ao local de partida. Duas últimas fotos são algumas semanas depois, quando nós andávamos a rota novamente. Se você está interessado sobre a caminhada nórdica, depois das fotos eu darei algumas ligações para conhecer melhor o que outras pessoas escrevem sobre isso. Para praticar a caminhada nórdica, você só precisa de pólos de caminhada nórdica. 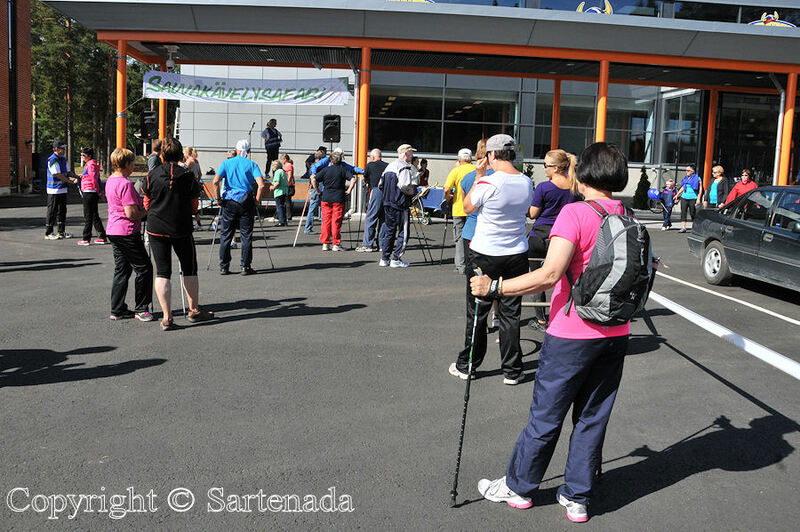 Nordic Walking, você já conhece esta novidade? Nature et sport sont excellente combinaisons. Nature aide l’esprit et le sport de notre condition physique. Ce fut une expérience très agréable. Merci pour votre commentaire si gentil. Veo que Anja participa a todo esto com mucho dinamismo, también! Es un post precioso, Matti! Es verdad que a ella le gusta muchisíma, pero no todas las días, solamente unas veces durarante el verano. Hoy a ella gusta más en correr. Muchas gracias por tu comentario. You’re going to be so nice and fit! I saw a big group of Nordic walkers, in costume, during Carnevale in Venice. Thank You for Your comment. 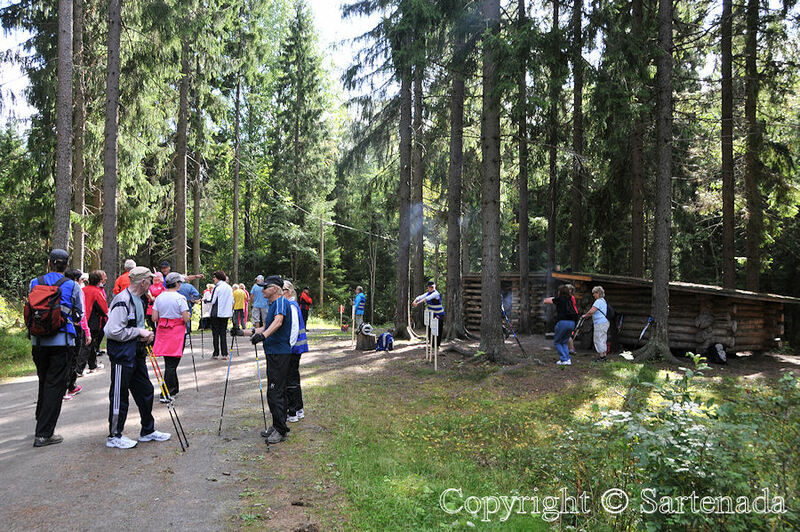 It was very nice to read that You have seen Nordic walking. It as fun indeed. The walking route was new to us and very beautiful. Thank You for Your comment. le long de nos chemins de campagne. Le reflet sur la onzième photos est magnifique. Belle fin de soirée et bon Weekend. Le fait est que nous aimons aussi la marche “normale” plus. Ma femme était curieux de voir comment se réchauffer. Les bâtons de marche étaient cadeau de son employeur. Aujourd’hui, elle aime courir un peu aussi. La chose la plus importante est de sortir, jouir de l’air frais, et, de la nature! I have not yet tried it – so far! ^^ But looking at your photos automatically intensifies the wish to start with it. To give it a try. People seem to enjoy it very much (and it’s healthy, too). 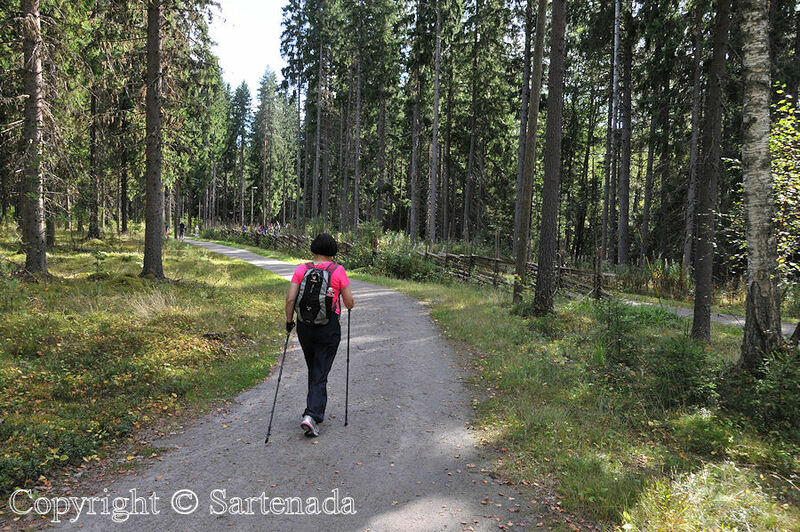 And you know, with such beautiful forests around (like you have them in Finland), it simply must be inevitable to start the nordic walking as quick as possible. Thank You for Your lovely comment. 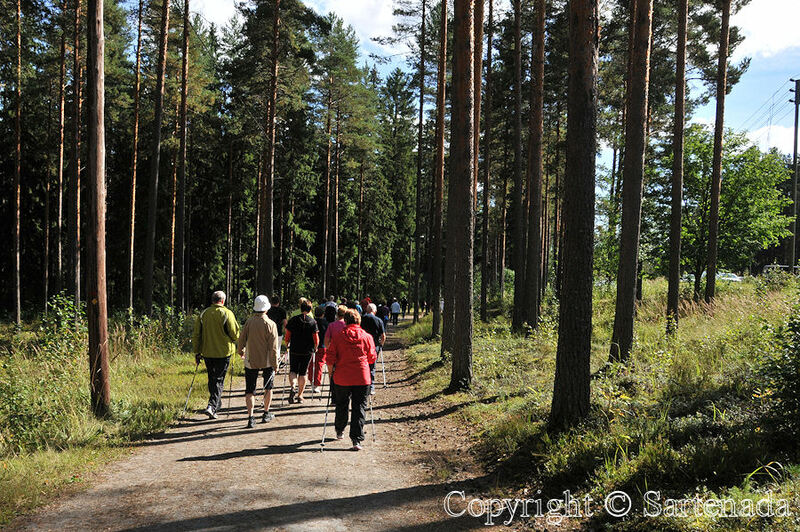 I translated this from a Finnish page: “Many studies have shown that Nordic walking is clearly – up to 20% – better than walking without poles. Walking with poles helps oxygen consumption to rise more, the heart rate increases more and muscles are working more than when doing ordinary walking. The length of poles is important! How to calculate the length of poles? Pole length is 0.68 x your height. So this is the easiest way to calculate the length of the poles. You must remember that what is suitable for one, does not fit the other, meaning that You can love it or not. That has to be very good exercise, and from your photos, you have a beautiful place in which to do it! It’s interesting to see all of the folks out doing it! When not hiking, this one way to keep oneself in good condition. My wife especially interested in warmup, because with poles man can make many “useful” training movements even inside. Thank You commenting. Thank You for Your comment. Well, this route was short. When exercising our daily walking, it varies between seven and ten kilometers. It keeps us in good condition. When we went for our morning walk last Thursday, my wife and I passed a group of people who were doing this. 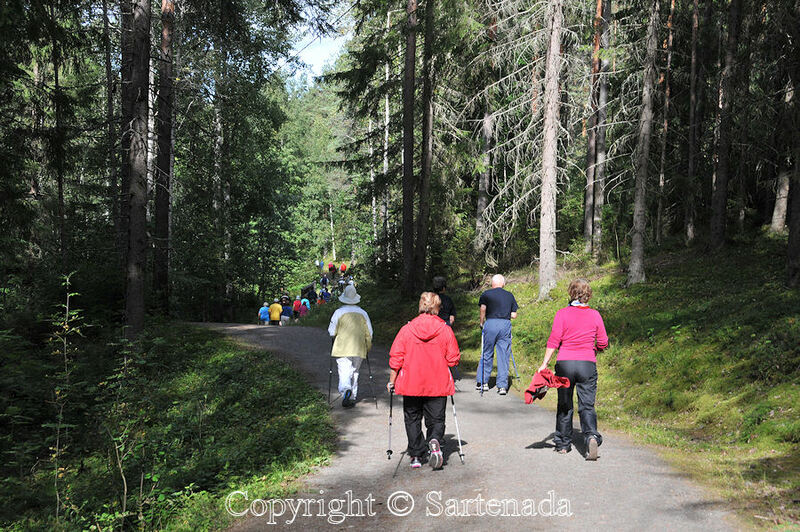 Oh, it was nice to read that You have seen Nordic walking there. Thank You leaving Your comment. Hello,Sartenada. It sounds nice! I can imagine how confortable to walk in nature. Autum is best season for walking, isn’t it? Autumn is best season to walk in in the nature, because it is not too hot, cold has not arrived and no mosquitos. Thank You checking my post and leaving Your comment. Oh, quel commentaire d’éloge! Eh bien, quelquefois vous pouvez le tester avec vos copains. 🙂 J’suis ravi que mes photos te plaisent. What a good idea – all the benefits of cross-country skiing without the frostbite! Yes, you got. I am that you commented this post. It took nearly one week to make including links. Thank You. The trail through the forest looks like Alaska! Lovely photos. I am glad that You loved my photos. Comparison between landscapes around the world is interesting to always. In this area there are pines everywhere. 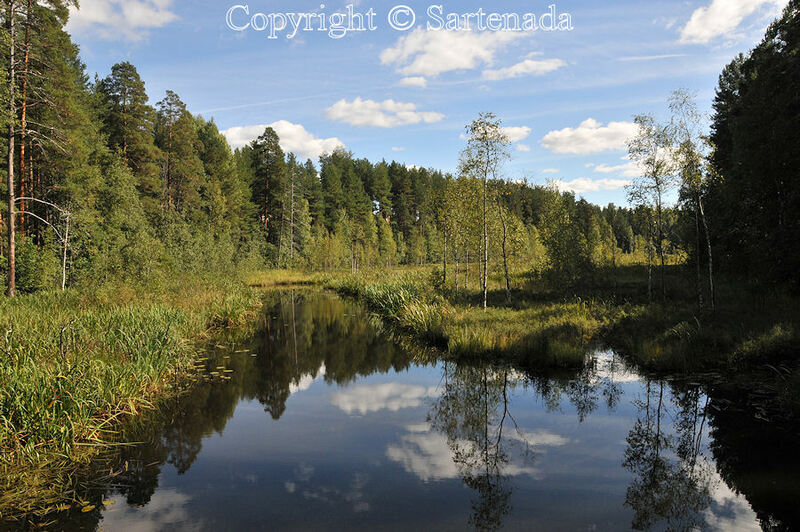 There are many types of forests here, like: mixed forests, spruce forests, birch forests etc. Thank You leaving Your comment. 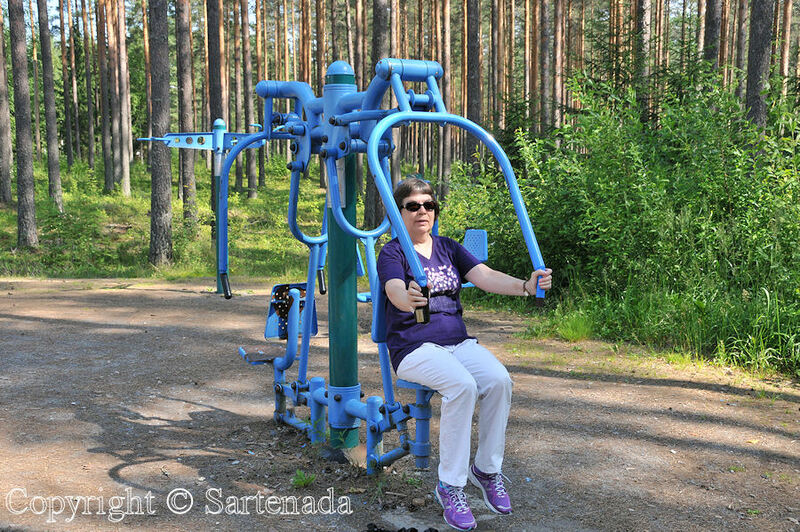 looks like great exercise and I like the outdoor exercise equipment too. We do have those in Canada as well. Thank You. Most important is to go outside to walk, run, bike, hike, what ever, but not to stay inside if possible. 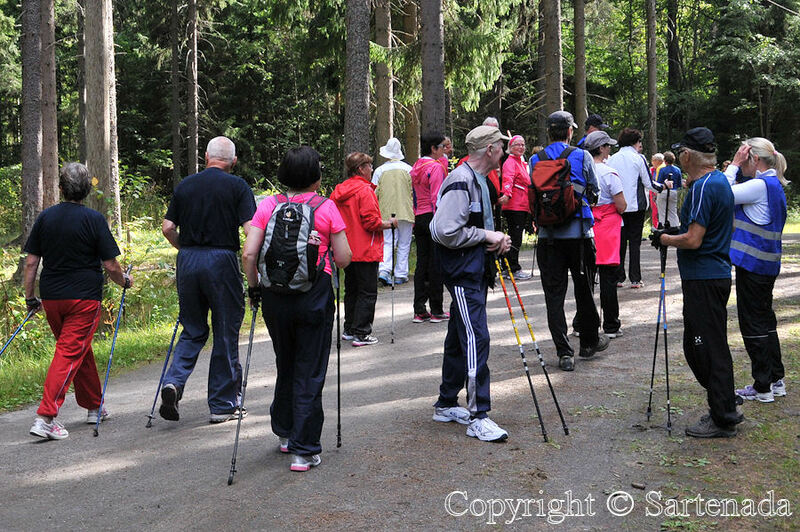 I was quite sure that Nordic walking was known in Canada also. 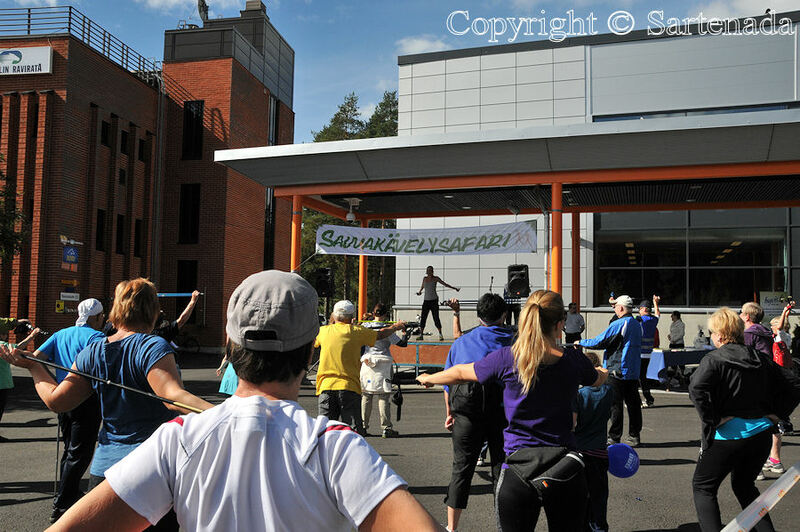 Yes definitely we have Nordic walking too. Wishing you a great week! 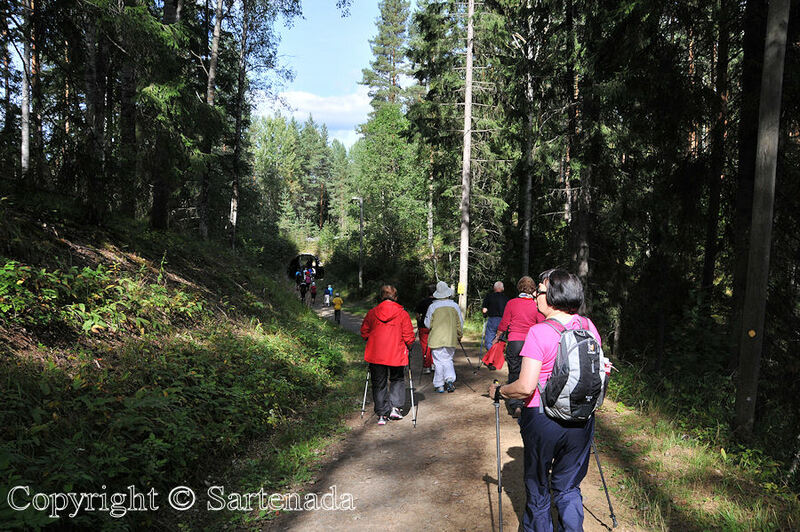 Nordic walking is also popular in Canada, but I have not seen such a large organised group yet, except for Nordic skiing. What a lovely and social day. 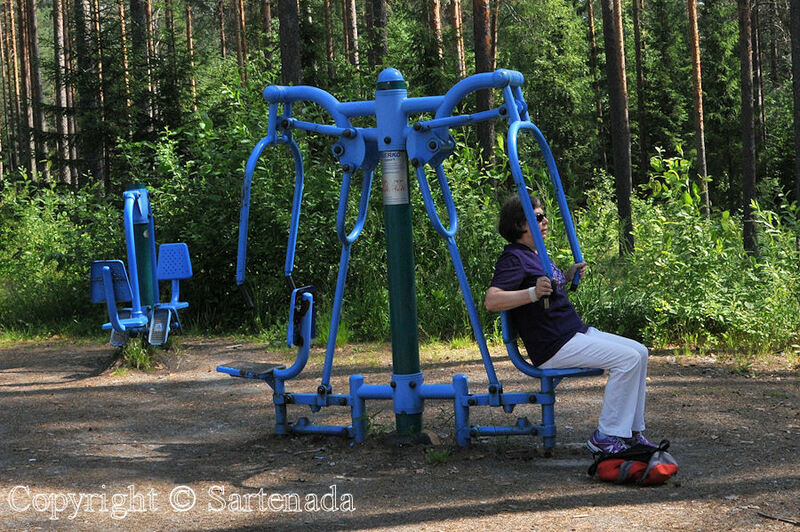 I like the exercise park or is that a playground for adults ? 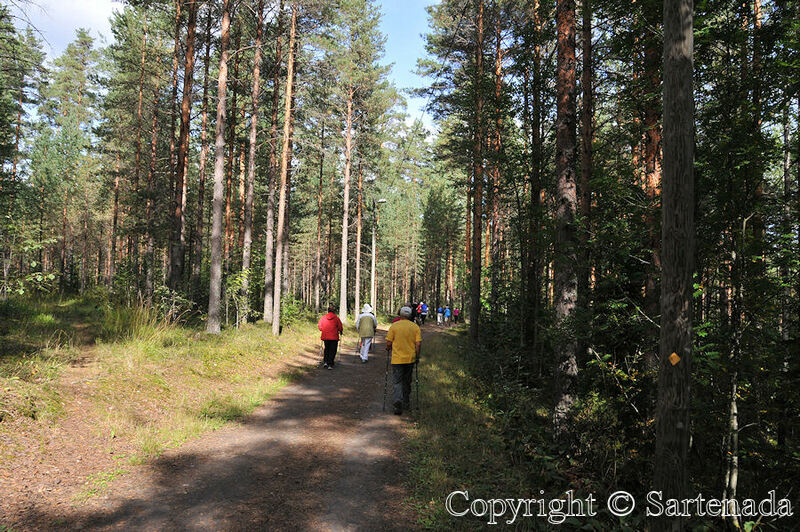 The exercise is for both, children and adults, but in this case most visitors are adults because the walk / hike in the woods. Thank You for Your comment. 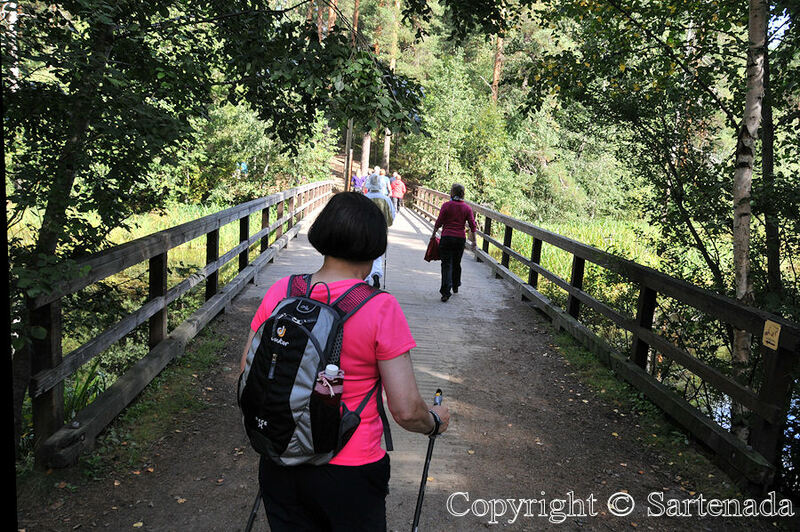 We even have Nordic walking where I live. One of the fitness centers promotes it. I have the poles that I used for hiking. If I could figure our how to hold the poles and the dog leash at the same time, I’d try it on my neighborhood walks. Thanks for another look into your lives in Finland, Matti! Okay, You knew this walking style! Yes, it is “mission impossible” to solve how to walk with dog and walking poles. I am very happy for Your comment. Thank you. Now, Japan is 9/19 AM.7.35. This was very nice to read. Thank You. I was lucky to be in Finland 2 years ago. I saw 2 old women walking with two sticks. I asked them what the sticks were for and they gently told me they were for Nordic walking. Two years in Finland. So You know a lot of m country! Thank You commenting. Fico feliz que você está de volta. Provavelmente foi ótimo para tentar parapente. Eu mesmo não ouso a tentar! I have seen the people of Nordic Walking in Tokyo sometimes. However, it is very rare. 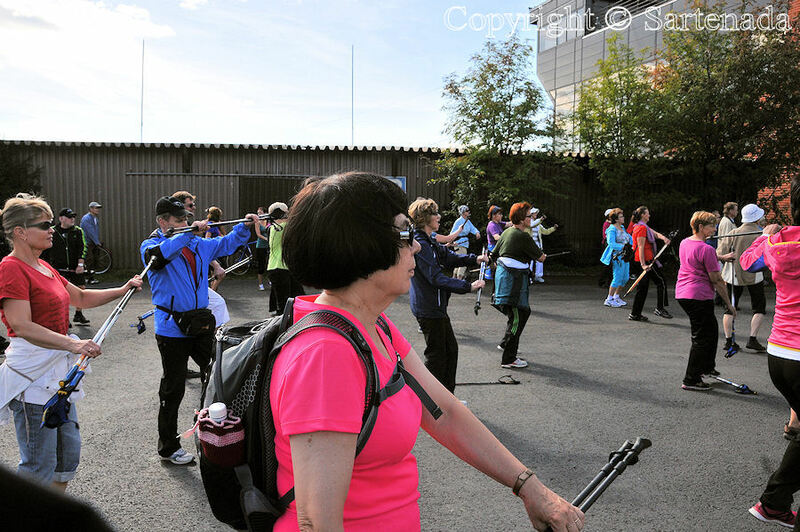 Nordic Walking is not well known to Japanese people. But I am very interested in Nordic Walking. I’d like to try it someday. Very nice, I think that it is worth for a try. 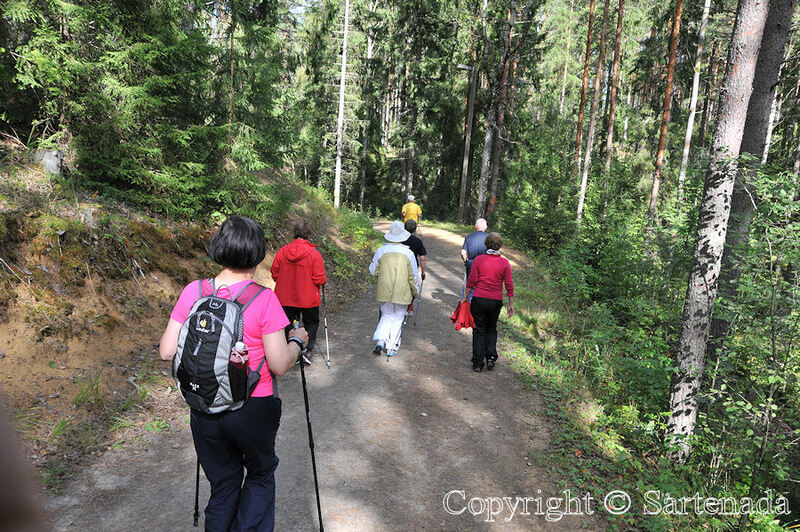 Normal walking keeps balance and feet in good condition, but Nordic walking also hands and shoulders. It looks like great exercise and the views are really beautiful! Thank You. With good condition we have healthy life. Recent studies reveal that walking is healthier than it was previously thought. Wow. This was positive surprise to me. 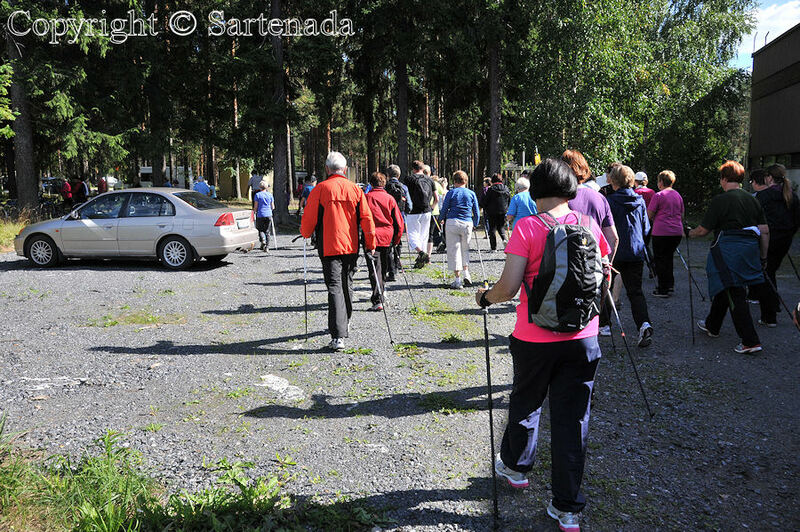 I am so glad that You told to us that You exercise the Nordic walking. Thank You for Your comment. What a lot of people together – a true social event! 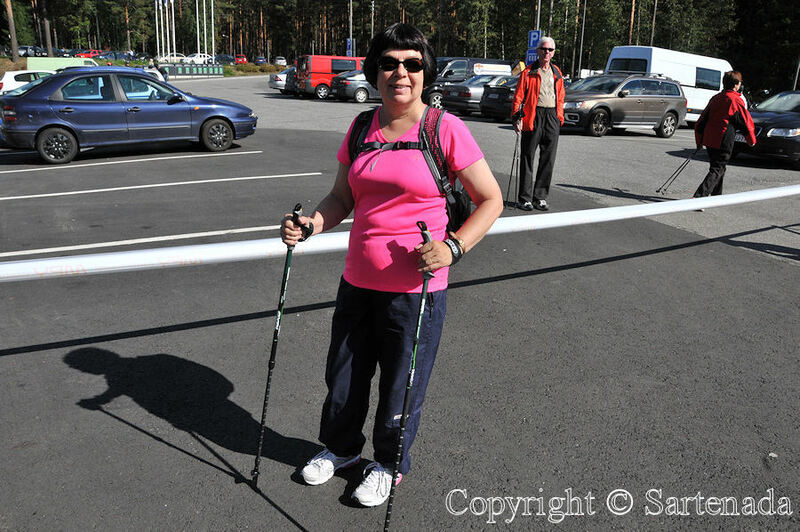 I use poles when I’m backpacking with a heavy load, but I obviously don’t do the proper Nordic Walking thing! 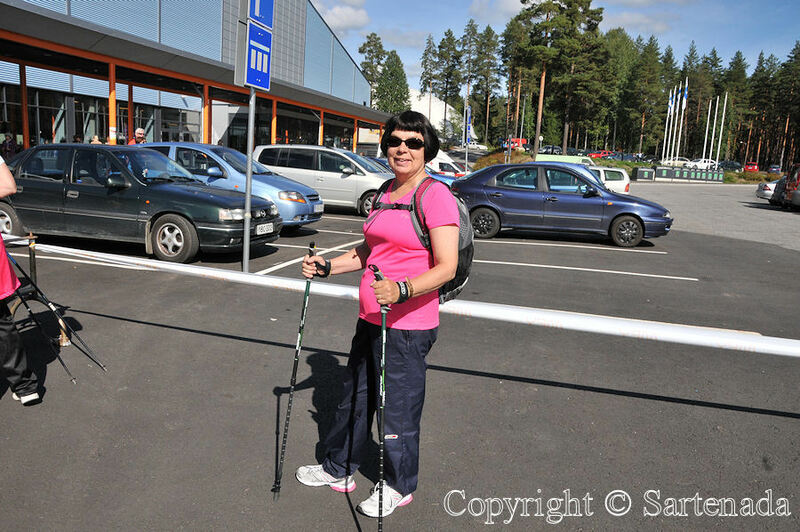 I do not know what is the proper way to do Nordic walking, but most important is just leave house and enjoy life as well physical exercises. Thank You commenting. That’s really interesting! Only very occasionally do we see people walking with poles here. So nice to hear that on the opposite site of the world it is known. Thank You for Your comment.